Learning how to read and understand food labels can help you to make healthier choices. Follow these tips when you are shopping to choose which brand or variety to buy. You can usually find the ingredient list on the back of packaged food. Ingredients are listed in order from largest to smallest amount. So, if fat, sugar or salt are near the top of the list, the food is unlikely to be a healthy choice. Sugar and fat are often listed in the ingredient list under different names. Common names for sugar added to foods are corn syrup, dextrose, fructose, glucose, sucrose, maltose, honey, invert sugar, golden syrup, maple syrup, and treacle. Common names for fat added to foods are butter, coconut cream, cream, hydrogenated vegetable fat, lard, margarine, oil, trans fats, triglycerides, vegetable oil. Most packaged foods must have a nutrition information panel. Some foods don't need to have one – this includes food in very small packages, and foods with little nutritional value such as tea, coffee, herbs and spices. The panel has information about how much energy, protein, fat, carbohydrate, sugar and sodium (the harmful part of salt) are in the food. It might also list other nutrients such as fibre, vitamins and minerals. There are two columns on the nutrition information panel. One panel lists the amount of nutrients "per serve", the other lists the amount "per 100 g" (or 100 ml if liquid). 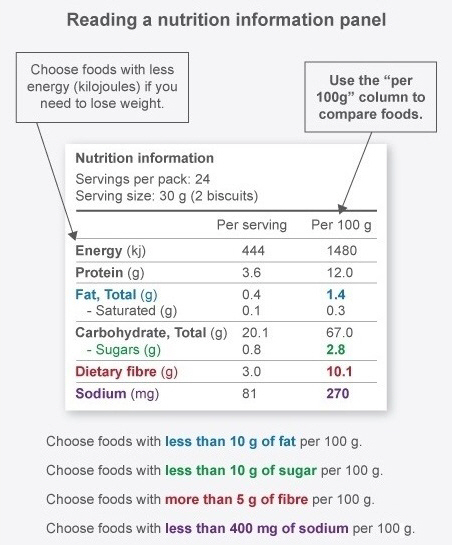 Use the 100 g column to compare similar foods and choose healthier products. This supermarket shopping guide gives more information about what to look for on the labels of particular foods. This free app lets you scan the barcodes of packaged foods with your smartphone camera. It then gives you easy-to-understand nutritional advice and a list of similar foods that are healthier choices. The Heart Foundation Tick logo is on more than 1,000 products in 60 food categories. Foods with a single tick are a healthier choice within that food category. For example, yoghurt with the tick is a healthier choice of yoghurt, breakfast cereal with the tick is a healthier choice of breakfast cereal. The single tick logo is on healthy foods like milk, lean meat, breads, and cereals. However, it is also on some treat foods such as ice cream and pies, which you should only eat occasionally. Foods with two ticks are core foods for a healthy diet. It's much harder for foods to get two ticks, so these foods, along with fresh fruit, veggies, and other unprocessed food, should make up most of your shopping. The Heart Foundation is gradually phasing this logo out, but it will still appear on some foods for a few years. Health Stars are a quick and easy way for you to choose healthier packaged foods. Health Stars rate the nutrition content of packaged food from half a star to five stars. However, the system isn't perfect. The system is designed to give more stars to healthier foods. But some foods with ratings of three or more stars are not really healthy choices. The best way to tell if a food is a healthy choice is to check the nutrition information panel and follow the rest of the advice on this page. Read the labels on the food in your pantry before you head out to the supermarket. Get an idea of the healthy choices you already have, and the foods you need to find a healthier alternative for. Once you get to know which options are healthy you will only need to check labels if you want to try a new product, different brand, or a supermarket special you haven't tried before. This page explains what the Tick and Two Ticks logos mean, and how to use them. 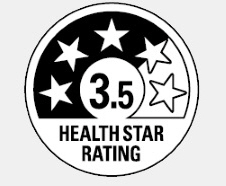 An explanation of Health Star Ratings. Written by HealthInfo clinical advisers. Endorsed by dietitian, Burwood Hospital, Canterbury DHB, Page created September 2016. Last updated March 2019.